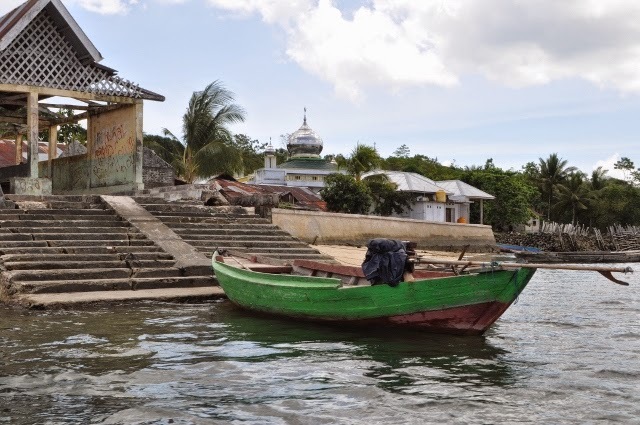 Arriving in Debut, Indonesia and exploring the anchorage and the surrounding town and countryside of Kai Island was our first introduction to Indonesia. We found ourselves enjoying it immensely, despite major communications barriers. The people are gentle and patient, and we managed to get by pretty well. 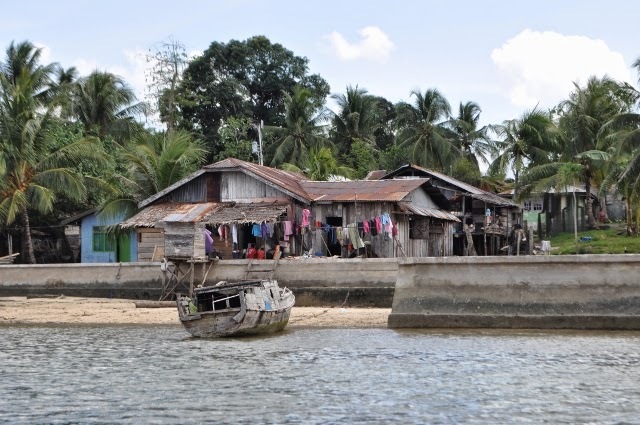 One of the things that made our stay so good in this anchorage was the hospitality shown by Mr. Koro, who drove us back and forth to shore (nowhere to land the dinghy -- very shallow landing area and then concrete steps, with nowhere to tie up), and Mr Addy, who was our taxi driver around Tual and the surrounding area. Wonderful people -- and service with a genuine smile. A tour around the Debut anchorage with Mr. Koro in his long boat. 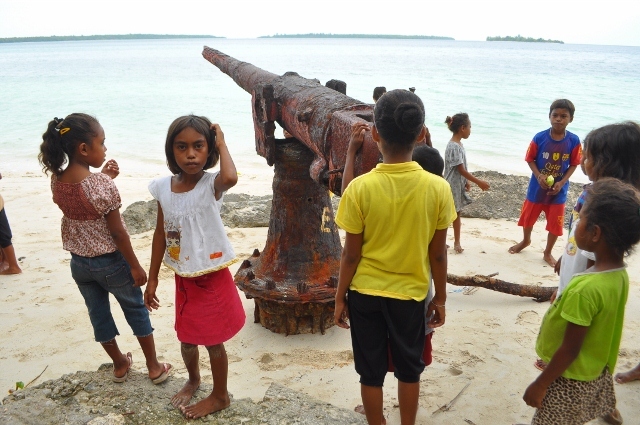 Debut, Indonesia, on Kai Island. 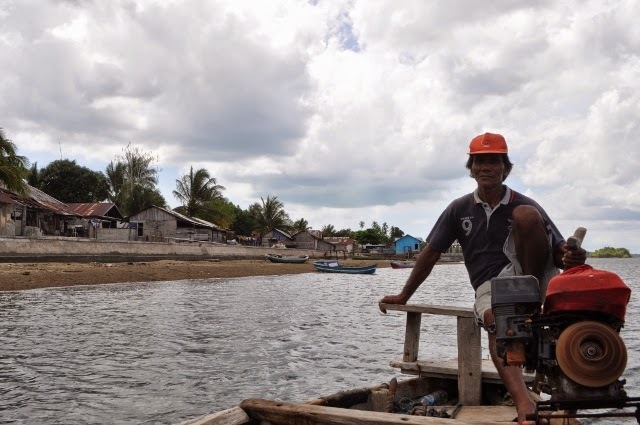 Largely a Muslim fishing village. 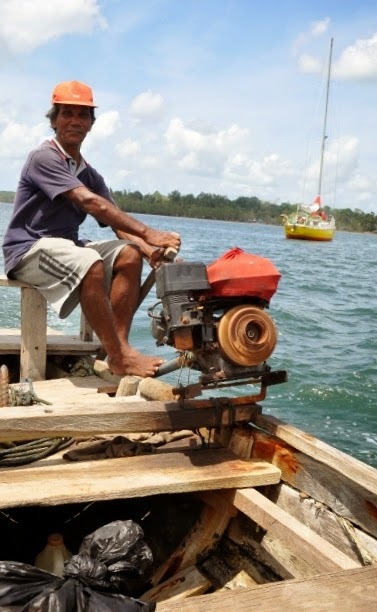 Mr. Koro and his outboard. 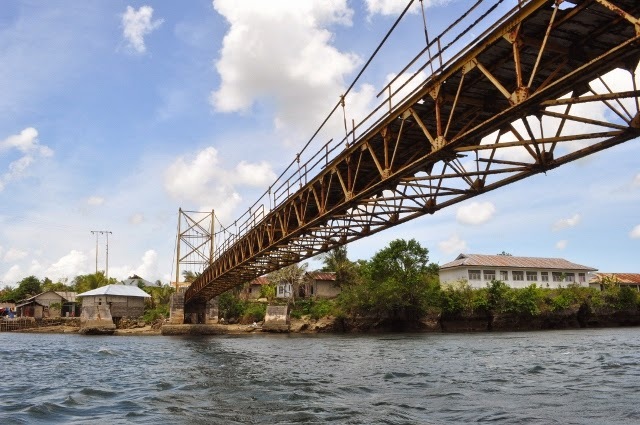 A tour around the anchorage took us under the bridge that we heard day and night as mopeds and pedestrians crossed it. Clatter-clatter-clatter. Lola and Jana in the bow of Mr Koro's boat. 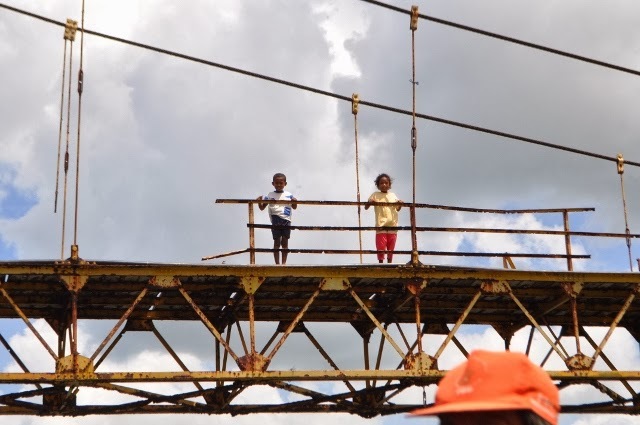 Kids on the bridge. We found the children in our first stop extremely curious and friendly. Even with no English, they managed to express themselves quite well. And we never had the feeling they really wanted anything, other than to be friendly. A nice welcoming feeling. 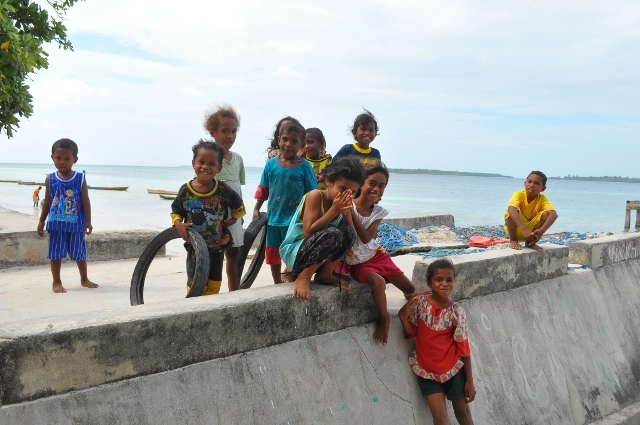 Kids on the foundations of the bridge, at the island where they are building a new dam in Debut. 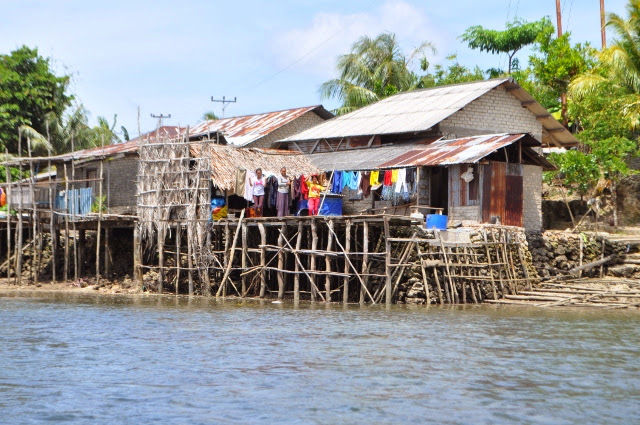 Common structure for houses along the waterfront in Debut, Kai Island. 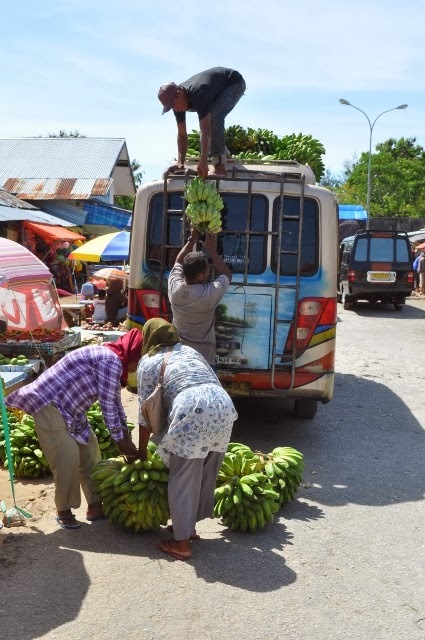 In the big city of Tual -- the market. Fruits and veggies for the first time since Vanuatu. The large grapefruit were a disappointment, but the cucumbers and papaya did not disappoint. And bananas -- lots and lots of bananas. 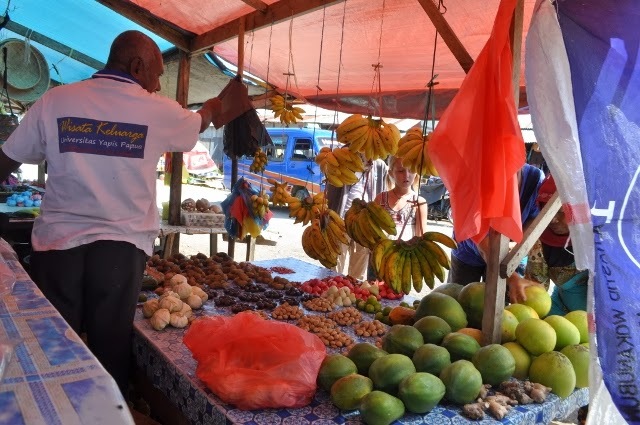 A typical market stall in the Tual market. Jana gets squeezed. For the first of many times. We discovered that Indonesians adore Jana. Her blond hair and fair skin prove irresistible and their natural response is to grab her and pinch her cheeks or arms – hard. She grins and bears it and carries the burden for the family well. Lola and Jana make friends in the Ministry of Tourism,Tual. These women insisted on having a photo taken with Jana and Lola – a practice we would soon become well acquainted with. This is where our check-in happens. In Tual, there is a whole office dedicated to tourism, but we’re not sure what they do exactly because there is a lot of sitting around and smiling – and so many officials for a place that sees very little tourism. Perhaps they are trying to promote tourism more? Perhaps it’s part of a programme to bring more people to their region? We could not tell. 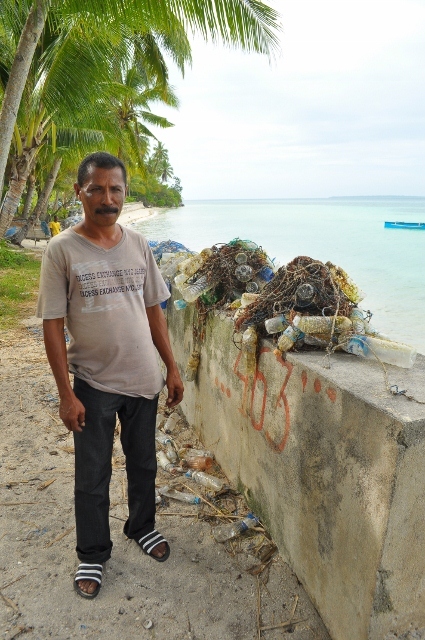 But we did meet Mr. Budhi, who was our ‘agent’ and helped us check in and clear our boat into Indonesian waters. Queuing for benzin. 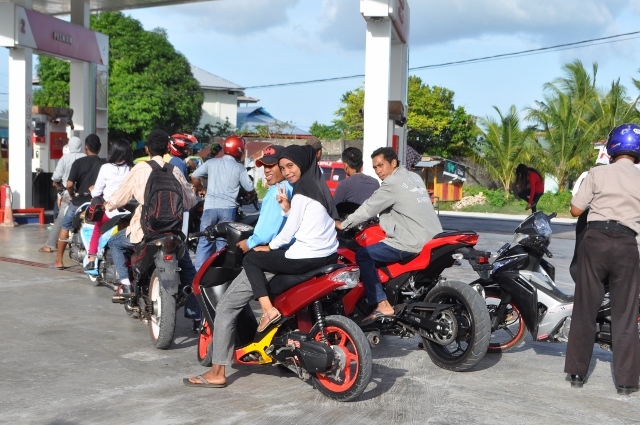 Mopeds are the common form of transportation, and the lines for gasoline are long. 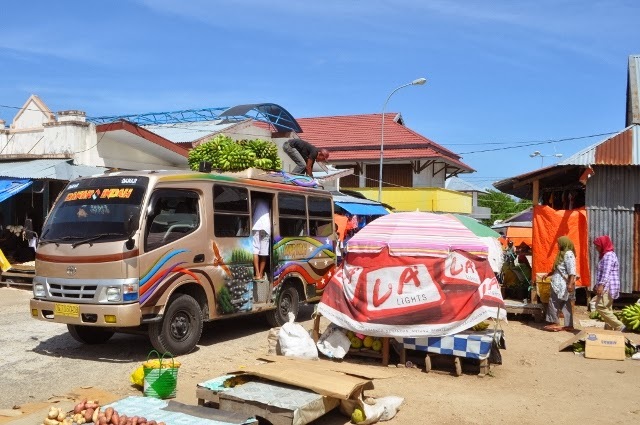 Visit to a beach resort area where on weekends this area is packed with Tual City residents who come to relax and eat large family meals. Visit to a local village and their school. These kids performed songs and played games with Lola and Jana and the teachers gave us a tour of the school. We met one teacher named Bean (who says to pronounce it “Ben”) who met us the next day and took us around the island on another tour. Ben’s English was pretty good so we could ask questions and understand most of his answers. Mr Bean and his school -- with Lola and Jana in the mix. The kids played games with Lola and Jana and we were wined and dined by the school teachers in the evening. Our introduction to home-made banana fritters and potatoes. Yum. Visit to Mr Budhi’s school, where the students learn home economics and language to prepare themselves for the tourism trade. They learn hospitality (hotel management), food services (cooking) and textiles (sewing) -- and they have special classes in English . 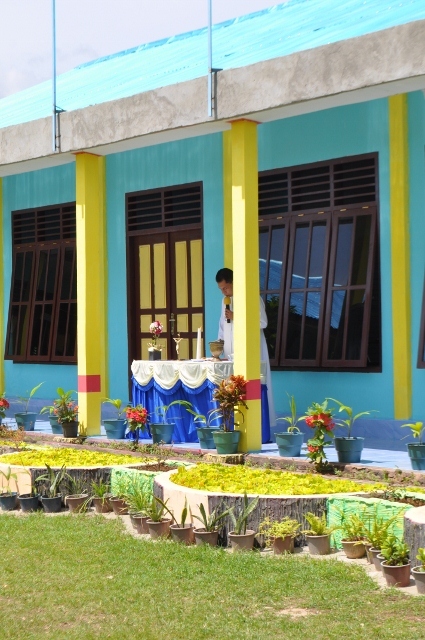 On this day, they were dedicating a new building so we were invited to the ceremony where the building was blessed and the students then sang songs. We then went on a tour of the school which included some treats – fresh papaya/ mango juice,among other things – and also a request that we sit with a senior class and talk to them about who we are and where we come from. We had a fun hour or so with them – answering their questions and also asking some things about their school. A couple of them demonstrated impressive language skills, and they were a friendly group of kids and teachers. 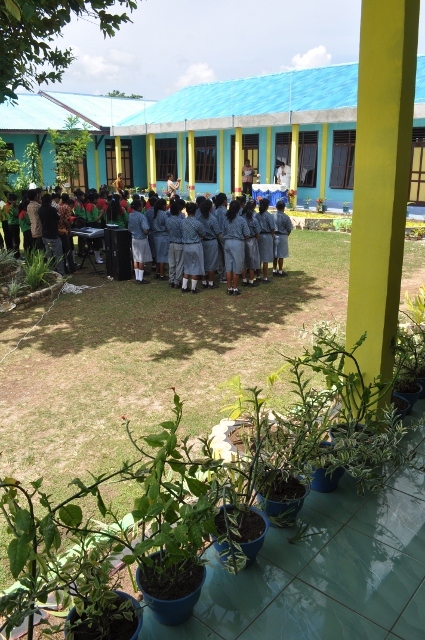 The students gather to sing for the ceremony at the Tual City School for Tourism. Teachers sitting in the shade (with the guests, too!). One of the things that struck us about the architecture in Tual was how colorful it is. It's bright and cheery. You can see they did not go for subdued colors on this new building. 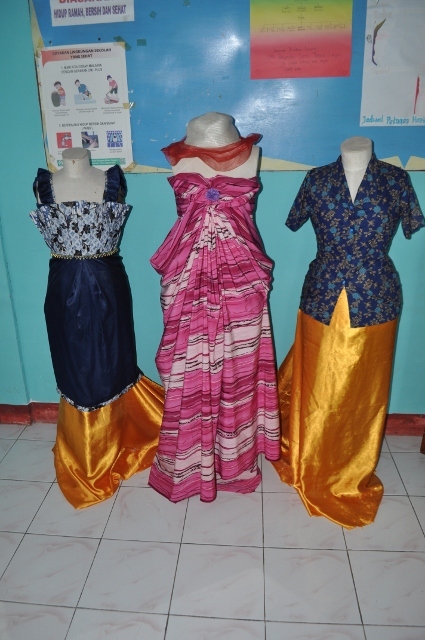 And in the costumes below, made by the students at the school. 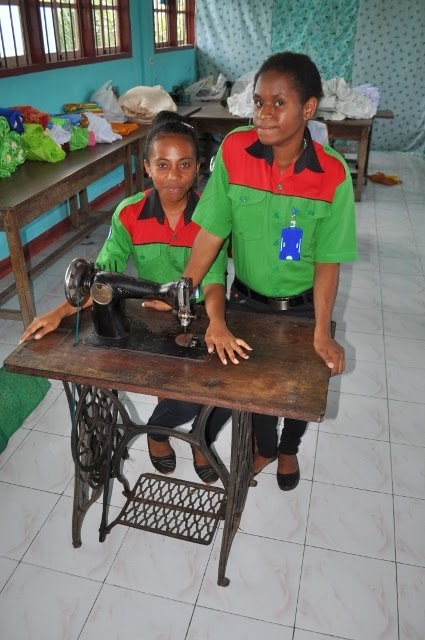 More photos from the School for Tourism: Students and their Singer, and the showroom with some of the things they make, including clothing and crafts, such as the entire wedding outfits made for the wedding of one of the teachers. 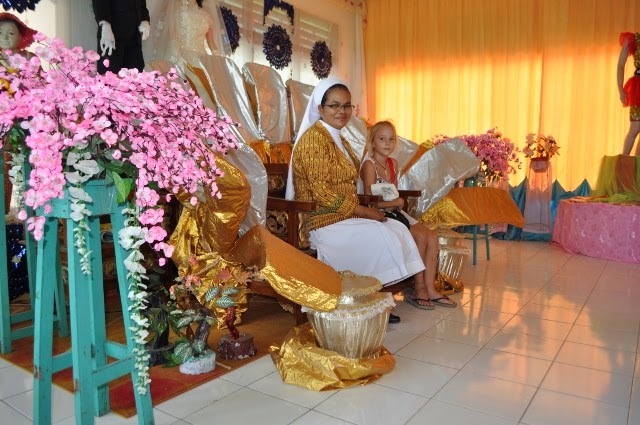 The school made the bridal gown, the groom's suit and a very large wedding settee -- featured here with the head of the school and Jana sitting on it. We took a day-trip around the island of Kai and visited another small village on a nearby island, off the northwest coast. The locals were keen to show us their 'museum' and other sites, so we were excited to see what this was all about. 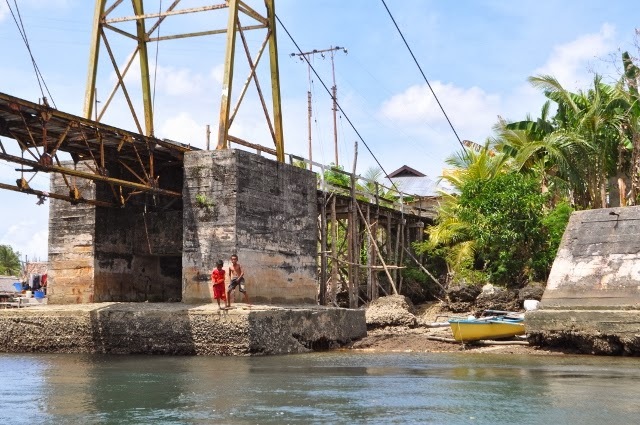 We were treated to a wonderful visit, and this village, more than anything else on Kai, reminded us of some of the Polynesian villages in the South Pacific. Village life and rhythms are much the same, though this particular village is preparing itself for what it thinks is the inevitable onslaught of tourism in the near future. In fact, they are gearing up for it and hoping it brings more visitors. We were among the few visitors this year. 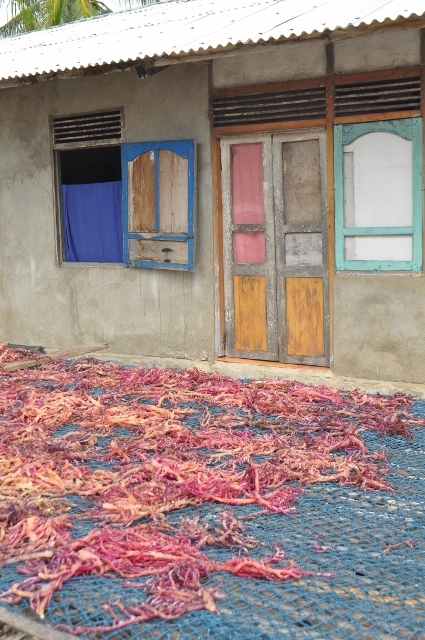 Seaweed drying in the village. The sell it to local restaurants and eat it at home, too. 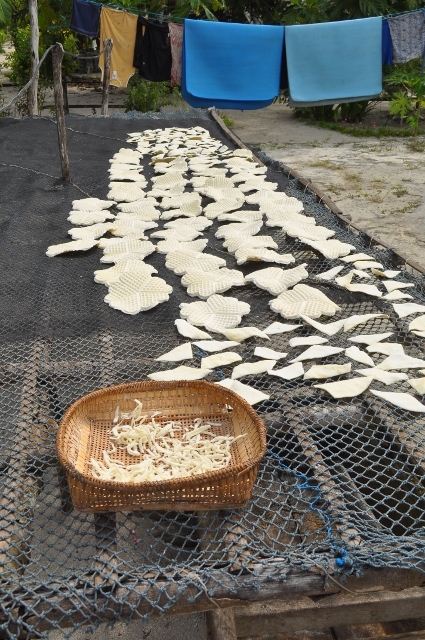 Root of the cassava plant, poisonous to eat in its pre-dried state but then formed into waffle-shaped dried snacks which you find in stands on every street corner in towns across Indonesia. Village kids singing to us and serving coconut water. 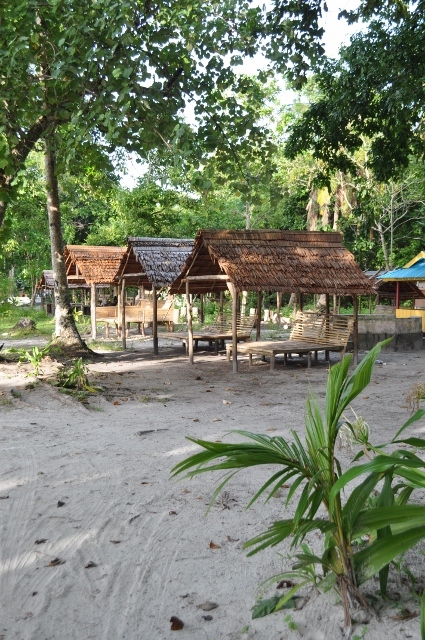 The heart of the tourism attraction in the village. This is the "museum" -- a remnant of Japanese artillery from the second world war. Terima Kasih! And Sempai Jumpa! Mr Addy, our taxi driver in Tual/ Debut, and his father. Mr Addy drove us for the 3-4 days we were in Kai Island. 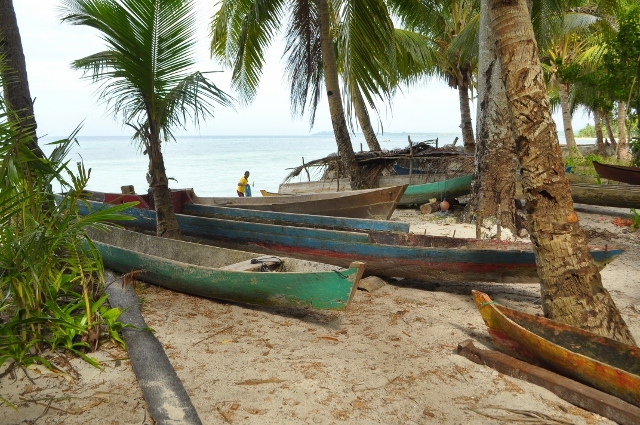 He drove us back and forth between our anchorage in Debut and Tual City (8 km away), and all around the island. Each day we paid him $15 or $20 for his services. He was a wonderful guide and a great help while we were there. And he took a real shine to Jana – as demonstrated by this gift on our last day with him. 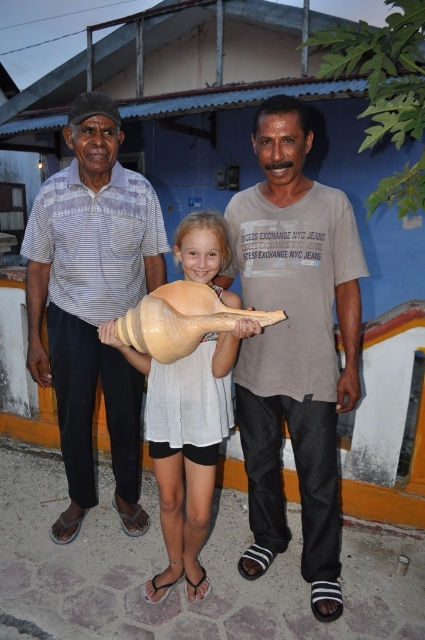 He stopped in his house on our way home and emerged with this enormous shell – a beautiful gift for the delighted and genuinely surprised Jana. We're still trying to figure out how to fit in on board. Saying goodbye to Mr Addy and Mr Koro – our two guides in Debut. They came for coffee on our last morning, and despite profound language gaps, we managed to share a few stories and enjoy one last visit before leaving for new stops in Indonesia. 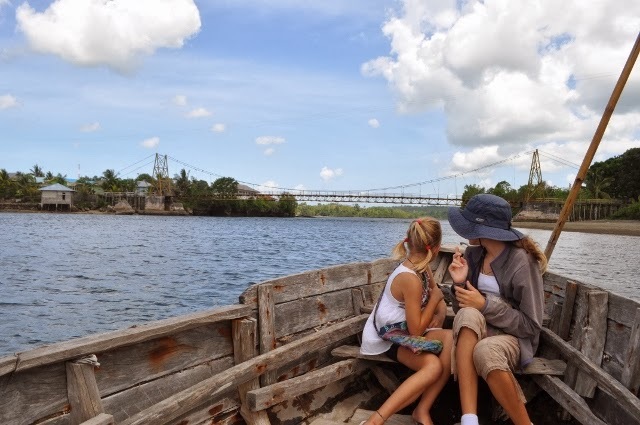 Michelle and Bernard have been living and travelling aboard Momo with their two daughters, Lola and Jana, since 2003. Bernard Heise works as a German-to-English translator and is a member of the New Zealand Society of Translators & Interpreters. Along with working for agencies in the legal, marketing, and financial fields, he specializes in academic translations, primarily in the social sciences. You can download his CV here. Momo went over to the door, touched it with her hour-lily, which had only one petal left, and opened it wide. The time store was cold no longer, now that the last of the time-thieves had gone. Momo marveled at the contents of the huge vault. Innumerable hour-lilies were arrayed in its endless shelves like crystal goblets, no two alike and each more beautiful than the other. Hundreds of thousands, indeed, millions of hours were stored here, all of them stolen from people's lives. The temperature steadily rose until the vault was as hot as a greenhouse. Just as the last petal in Momo's hour-lily fluttered to the ground, all the other flowers left their shelves in clouds and swirled above her head. It was like a warm spring storm, but a storm made up of time released from captivity.